Our guide, Falen Mills, discusses Tlingit culture prior to our tour of Kake. Kake is a small village and home to about 500 residents. According to today’s information sheet, the name translates in Tlingit to “mouth of the dawn” or “opening of daylight”. The Kake tribe of Tlingits have inhabited this region in Alaska for thousands of years. They’ve largely maintained a subsistence lifestyle, through fishing, hunting, and gathering plants and berries. Considered one of Alaska’s premiere fishing areas, it’s easy to understand why Tlingit people had a reputation among early European and American explorers for fiercely defending their ancestral home and trade routes in the Kuiu and Kupreanof Islands from neighboring tribes and from early Americans. Carver Mike Jackson demonstrates his craft. Kelli Jackson, one of our expedition leaders onboard the Chichagof, is from Kake. Today is a special day for our visit because it’s her 22nd birthday! 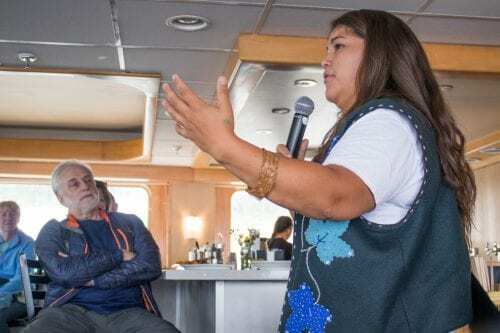 Last evening in the forward lounge, she gave a presentation on traditional foods of the Tlingit. 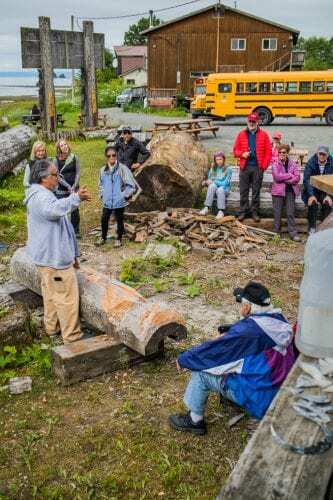 Each year, subsistence foods are collected and prepared in the old ways to teach youth about their culture, their connection to all living things, and the food that directly ties them to the land and sea. Kelli shared with us photos of her collecting and preparing traditional foods with her family. She brought a jar of seal oil and a mason jar of salmon strips to pass around. The seal oil smells like herring, if you’re curious. We all were! Our guide from Kake, Falen Mills, took us to meet local carver Mike Jackson. He demonstrated how he uses the tools of his craft to carve totem poles. 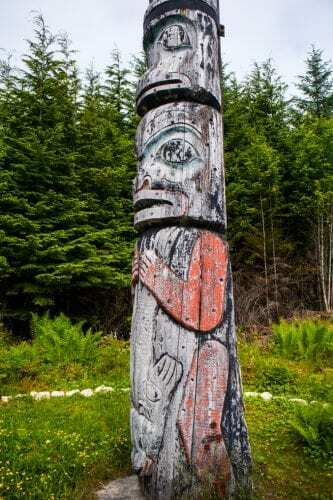 Kake has the tallest totem pole in the world which was raised in 1971 to commemorate the 100th Anniversary of the Alaska Purchase. Kelli, at center, is photographed with her family. 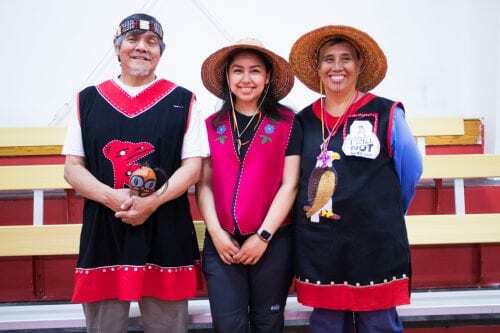 Along this journey on the Chichagof, we’ve met several impressive young people who’ve shared with us their determination to keep their culture alive. Kelli shared with us her goal to complete her education and return to Kake to help grow its economy so that it can become an affordable place for residents to live. This is an important role for the survival of the Tlingit culture. We assembled in the gymnasium of the school and were treated to a dance performance by the Keex Kwan Dancers. 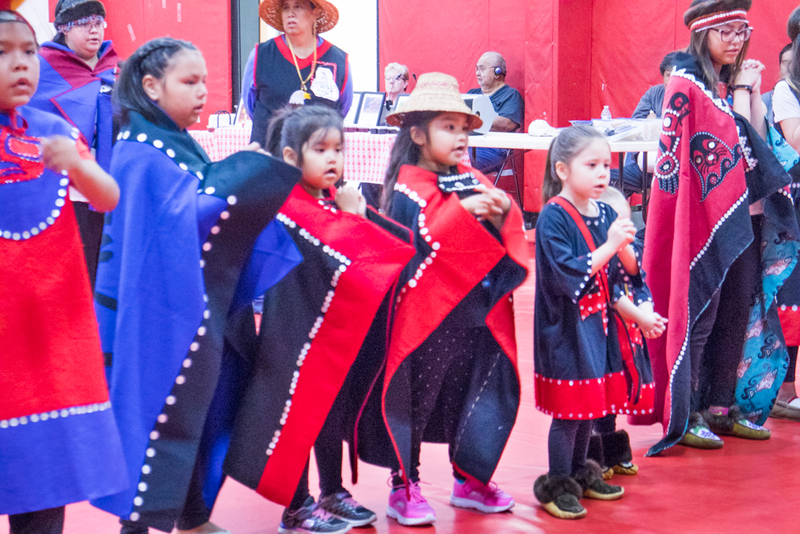 The deep connection and respect the Tlingit have with nature and each other is evident in their singing and dancing, as well as their culture of generosity for sharing their time with us today. We all sang Happy Birthday to Kelli and then we joined their final dance. We find it increasingly difficult in our fast-paced, technology-centered lives to find balance between work and family and that’s why we’re drawn to places like Alaska because nature has a way to remind us what is truly important. For the Tlingit, the True Alaskans, it’s a “Peace of Kake”.